The 2019 M.A.P. was a huge accomplishment for all of our students! Every student participated, including a student of student teacher Lilia. Our visiting artist, Jee Wong from Las Vegas, had some wonderful comments for each young pianist. A few are listed below. Congratulations to everyone: Landon, Linnea, Gavin, Sky, Madison, Megan, Judson, Calvin, Lucas, Lilia, Alexander, Luke, Viveka, Isabella, and Chloe! What an enjoyable way to spend a day, listening to all of you! Good job and thank you for all of your hard work! Keep your bridge firm. If a spaceship were to land on your bridge, would it hold it up or collapse? Press into this molding clay. That’s how hard you need to press the keys. For accents, imagine I’m going to suddenly put an ice pack on your back! How do you say the same thing 4 times loudly? Scream, yell, scold, raise voice. Feel the forward momentum of the music. Make a wheel with your arm and spin! Bounce your wrist, like you are dunking a teabag into a cup of water. You know your notes, now let you and show FREEDOM! Big chords and accents: grab a dandelion and yank it out by the roots! OCO Concert with Chloe and Lilia! All smiles after it’s done! The girls received flowers from the orchestra, family and friends, and also a lovely scholarship. Thank you, OCO! Waiting to dazzle the audience…. Do they look nervous? Due to the 2019 “Snow-pocalype”, Chopin NW was moved forward a week to Feb. 16. Lilia had planned to play her Scherzo #1. Megan performed the Polonaise in A Major and Prelude in F# minor. Chloe played Trois Nouvelle Etude #1 and Fantasie Impromptu. Video clips will be available soon! Update: Chloe won a Silver Medal in Division 3. Way to go, Chloe! At last month’s group lesson, students filled out a short questionnaire about themselves, then were secretly assigned a “pal” to compose for. The results were amazing! Everyone was able to write something meaningful and delightful, despite finals week for our high schoolers! This year, we had 8 students participating in the Concerto Festival: Luke, Viveka, Calvin (Lower Intermediate); Isabella, Sky (Upper Intermediate); Chloe (Advanced A); Megan and Lilia (Advanced B). Every one of you played VERY WELL! I’m so proud of all of you! Of course, with 60 of the best young pianists in the region, not everyone will get a prize, but you should all be proud of your efforts and your ability to do your best under pressure. 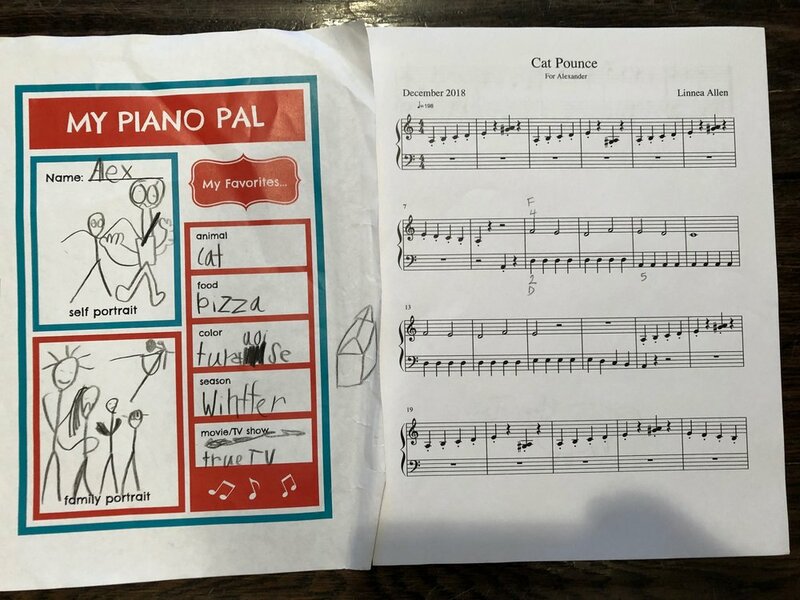 You are all fantastic young pianists! Lower Intermediate: Calvin, 3rd place. Upper Intermediate: Isabella, Honorable Mention. Advanced A: Chloe, 1st place! Advanced B: Lilia, 1st place! Advanced B: Megan, Honorable Mention. The first prize winners in the Advanced A and Advanced B sections win a performance with the Olympia Chamber Orchestra in February. It is always a spectacular concert, and I hope many from our studio will be able to attend to watch and support Chloe and Lilia! They will be performing from Beethoven’s 2nd Piano Concerto and Mendelssohn’s 1st Piano Concerto. Chloe (1st prize), Advanced A division: she performed Beethoven’s 2nd Piano Concerto, 3rd movement. Lilia (1st prize) and Megan (Honorable Mention): Advanced B division. Lilia performed Mendelssohn’s G minor Concerto, 3rd movement, and Megan performed Shostakovich’s Concertino, Op. 94. We will be having a Concerto Recital the week before on Friday, Nov. 9, 7-8pm (at my house) featuring 8 students from our studio. Please feel free to come to either, or both! The level of playing is fantastic, and I know you will enjoy hearing these young pianists! I especially encourage anyone considering next year's Concerto Fest to come. Cookies will be served! For the students performing at the competition on the 17th, please check in 10 min. before your division's start time. Bring your music for the judges and make sure the measures are numbered. As discussed in lessons, it's time to get into "performance practice" mode! Thank you all for your hard work! It's been an exciting fall, full of good music learning. I am thankful to be working with such an amazing group of kids! Judson came to his lesson today with some of the tiniest pianos I have ever seen, all created by himself! The first piano is made of nano blocks of his own design. Since he also plays the cello, note the little white cello leaning on a chair, and the music stand. So creative! The black piano and bench is an origami design he found online. Note the black endpin detail for the cello. P.S. You should ask Judson about his ship designs sometime…amazing! Build a Piano, Eat a Piano? Can you build a piano and eat a piano, all in the same day? One student proved it is possible! 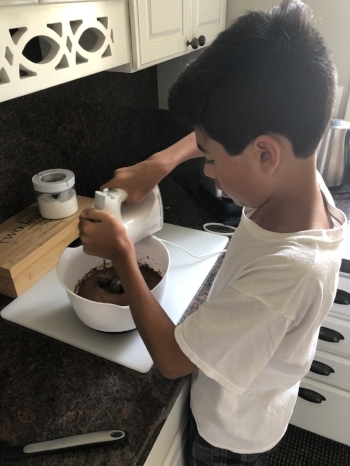 Here are some pics from Gavin's mom to prove it! This piano looks amazing! And delicious! Gavin, will you please bring an edible piano to our next piano party?! CONGRATULATIONS TO ALL GUILD PARTICIPANTS!! I'm pleased to announce ALL students received a Superior Plus or Superior rating! Wow! We also had three perfect scores: Lilia and Chloe (2x!). Four scored 40 or over! Lilia, Chloe (2x), Alex. Good work to everyone! A sheet was passed out to students at the Spring Recital for summer music making ideas. Anyone who completes 8 of these by the first fall lesson will get a prize! 1. Attend a live music concert! Write down your favorite songs and what instruments you saw. 2. Perform a mini-recital for your relatives or friends. Make your own recital program on the computer. Be sure to include a bio of yourself and list at least 4 pieces you will perform. 3. Learn 2 new pieces from your lesson books, and surprise me at your next lesson! 4. Purchase a new piece of music from the local music store or online with your parents and learn it! 5. Teach a piece to a younger sibling or friend. Write your friend's name and the piece title you chose! If you do this twice, this counts twice! 6. Compose a simple, short piece. Give it a title and perform it for me at your next lesson. 7. Listen to at least one piece of music by each of these composers online with your parents: Franz Liszt, Ludwig van Beethoven, Robert Schumann, Sergei Rachmaninoff. Write down your favorite! 8. Play all of your scales and technique with metronome. Write down the metronome speed for each day. Stay with the metronome and see if you can get 4 notches faster! 9. Listen to piano music while you eat your breakfast every morning. Mix it up to include different styles! 10. Learn a duet and play with someone. It can be with another pianist or a different instrument. 11. Watch 4 "Piano Guys" videos on youtube with your parents. 12. Research how an acoustic piano works. 14. Research how to safely clean your piano and give those keys a good scrubbing! 15. Interview aunts, uncles, cousins, and grandparents and find out what instruments they know how to play. How many people in your family play an instrument? 17. Give your piano a big hug when you return from a vacation, and play your favorite piece! Four musical friends presented a delightful concert for seniors at Panorama on Monday, June 18 @ 6pm. Viveka, Isabella, Chloe and Sky (VICS) performed on piano, cello and violin in solos, duos and even a trio! Next time, we'll have to find a quartet! The audience loved it and had wonderful encouraging comments for all of them. Thanks for sharing your music with our community! Lilia and Megan perform at Panorama June 15 @ 6pm! Lilia and Megan delighted a group of seniors with an amazing recital at Panorama's Quinault Auditorium on Friday, June 15, 2018. The audience was enthusiastic as they nodded and hummed along to a number of pieces. The girls performed 3 sets of Bach, Beethoven and Chopin. After "guest artist" Lucas performed a couple pieces, Megan and Lilia played several modern pieces, ending with a flashy duet of Chopsticks. After the recital, we found out a number of members in the crowd were former musicians, band members and singers, even one was a former music professor at Dekalb! The concert was followed by a delicious dinner at local "Hot Stone" and "Grandpa's Ice-cream". The crowd loved the "C.S. Variations" duet as well as the other pieces performed! HONORS RECITAL - Winners are Alex, Lilia and Megan--congratulations! Winners are featured at the Honors Recital after M.A.P. Alternates are Chloe, Sky and Gavin. The end of the school year is quickly approaching, and Guild/Recital/End of Piano Quarter is even sooner--three more weeks as of this coming Tuesday! I will be sending home Guild sheets this coming week which contain a summary of all required elements of the exam at the National level--10 items! I told many students that THIS WEEK is the week to get the pieces polished and memorized, so there is enough time to feel comfortable and focus on artistry and expression, rather than notes and memory. I am so proud of these kids, they have worked hard all year and really sound wonderful! Quite a few students have learned over 20 pieces this year; several are over 30 pieces, and one is close to 40! Families, wouldn't it be a great experience for students to put on a mini-recital for grandparents, neighbors, and friends? Please consider having them share their music with others! If any of you are interested in playing in a retirement center or nursing home or other community center, let me know, and I can help you set something up! They are so appreciative! Summer lessons are available these weeks on a limited basis. Please let me know which weeks would work for you. If your student is planning to do the Concerto Competition in November at the Intermediate or Advanced levels, 2 lessons *minimum* are required. HONORS RECITAL - Winners: Alex, Lilia and Megan--congratulations! Alternates: Chloe, Sky and Gavin. Good job to everyone! WSMTA HONORS RECITAL COMPETITION -Lilia and Chloe received an Honorable Mentions and will receive a gold medallion on their certificates! Chloe Performs for the Masterworks Chorale Ensemble Concert! 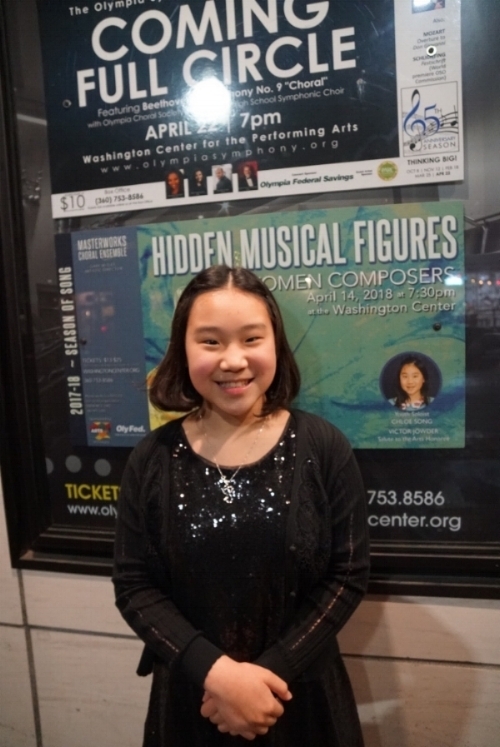 On April 14, our own Chloe was the featured "Youth Guest Artist" onstage at the Washington Center for the Masterworks Chorale Ensemble Concert. As the winner of the MCE Youth Competition last spring, Chloe was given this opportunity to perform, as well as a cash scholarship. Way to go, Chloe! 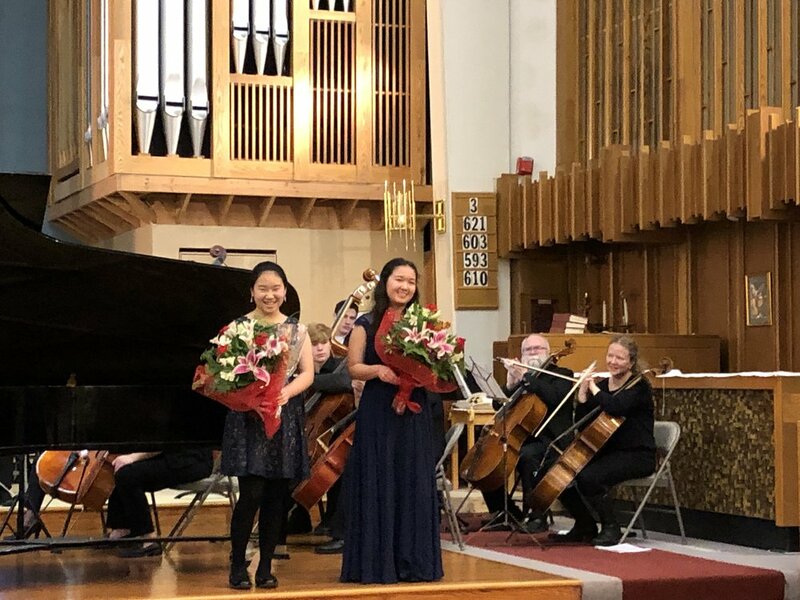 MCE's concert was all about Women Composers, entertaining the crowd with pieces by Clara Schumann, Amy Beach, Libby Larsen, Fanny Mendelssohn, and others. Chloe played Polonaise 1 & 2 from Clara Schumann's Quatre Polonaise, Op. 1. 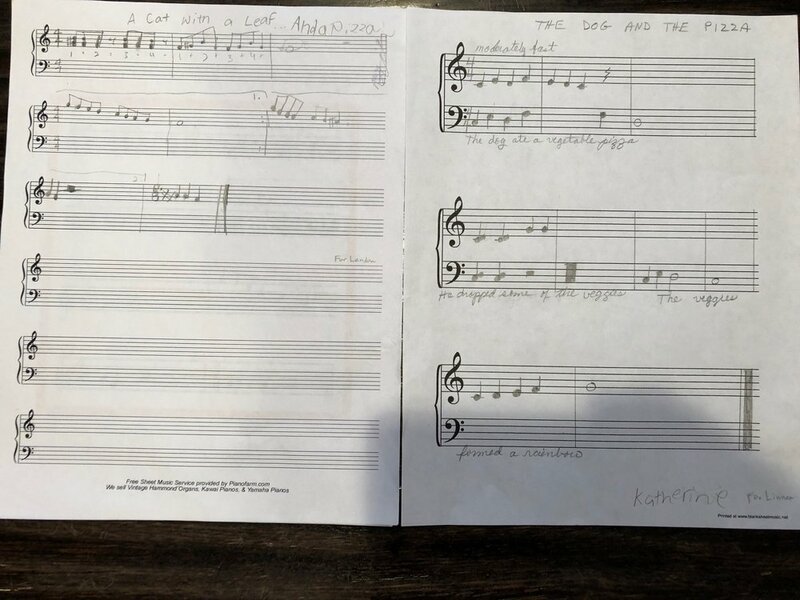 Clara was the same age as Chloe when she composed these four pieces. Chloe played with a youthful energy that those listening could imagine Clara herself had! Chloe smiling in front of her poster at the Washington Center. This must be after her performance, she looks so happy! Allen Studio Featured in National Piano Magazine! Our entire studio was selected to be featured in the Spring 2018 issue of "Piano Guild News!" Especially mentioned are our 5-year National Winners, Eleanor and Luke. Congratulations to everyone! I'm looking forward to another great Guild Performance from each of you! Hannah featured in National Piano Magazine for scholarship! Hannah has been featured in the Spring 2018 issue of the "Piano Guild Notes" as a recipient of the Gladys Smisor Memorial Scholarship. Read all about it below. Congratulations, Hannah! Lilia and Chloe take on the Chopin NW 2018! Two students from our studio, Lilia and Chloe, took part in the 15th Chopin NW Piano Competition. Featuring all piano music of Chopin, it was a day filled with beautiful music and incredible performances. There were 6 divisions according to age, from under 9 years old to 18 year olds and adults. WHAT A FANTASTIC DAY! Four rooms, four judges, 170 contestants, 32 hours of Chopin’s music and thousands of practicing hours brought us to this pivotal point to say CONGRATULATIONS to you all! You deserve the spotlight and I am certain that we will have a beautiful Gold and Silver Medalists’ Concert tomorrow, Sunday, Feb. 11 at 2 pm (Gold Medalists) and 4:30 (Silver Medalists)! Chloe and Lilia are all smiles after the Chopin NW! 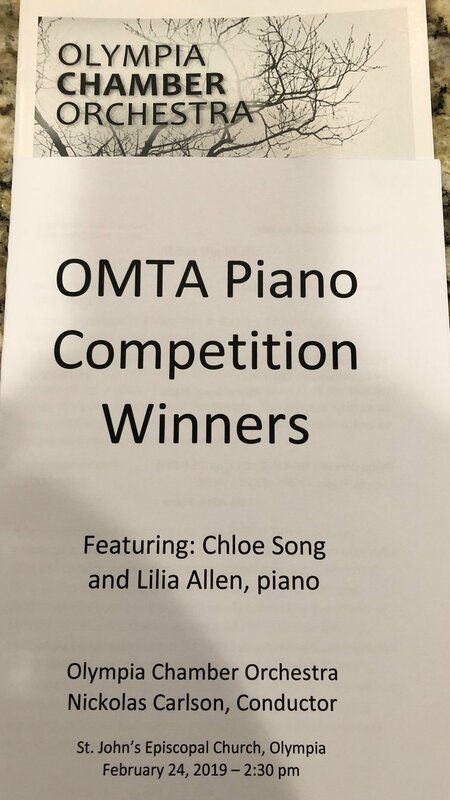 Congratulations to Luke, Gavin, Viveka, Isabella, Sky, Chloe, Lilia, Megan and Alex for beautiful performances at the 2017 OMTA Concerto Competition! 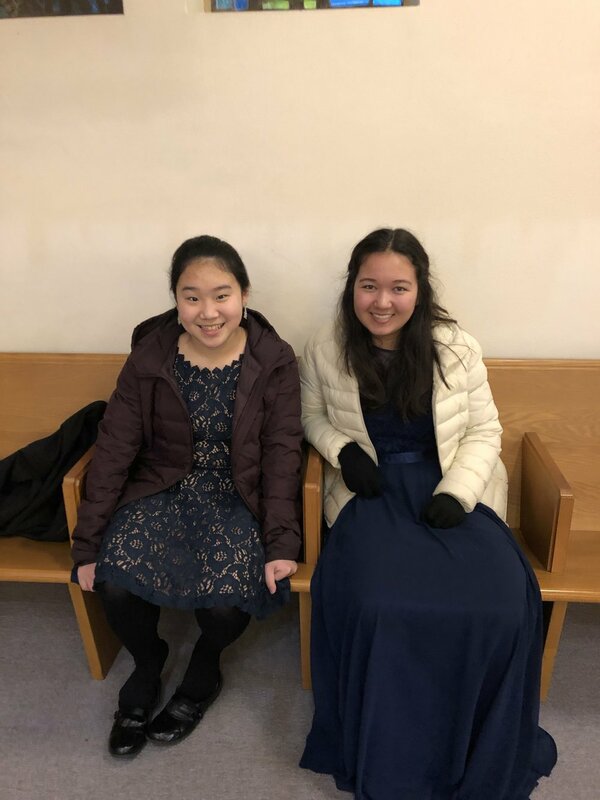 It was an impressive group of almost 60 young pianists from the greater Olympia region, performing concerti from Elementary to Advanced repertoire. The audience had a memorable time, as the above students played so musically and masterfully. Full results can be found on the olymta.org website in the next few days. Megan (3rd prize, Advanced B). Viveka and Isabella played beautifully in the Intermediate A Division. Isabella received 2nd place! Sky and Chloe performed in the Intermediate B Division. Sky received HM and Chloe 1st prize! Michael (student of Beecher who photobombed us and also was accompanied by Ramona), received 2nd prize. Megan performed Rhapsody in Blue and was awarded 3rd prize in Advanced B. Lilia played Mozart #21 for an HM, and Alex was awarded 2nd prize for his Shostakovich #2! Alex and Megan show off their hardware!